It looks like Saturday was the most popular day, but not by much. The two fields of interest for our pivot table. Note that we've used the RELATED function to combine them into a single table, to make the field list look neater. 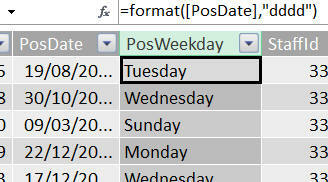 You can use the FORMAT function to get the weekday corresponding to any date.